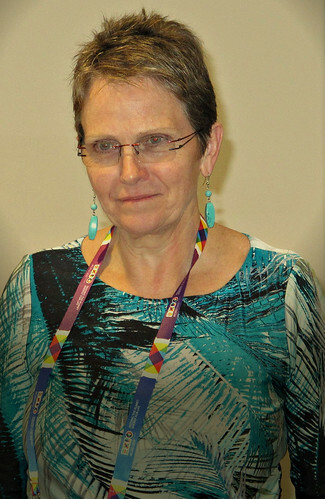 This article is written by Shirley Tarawali (standing, above), ILRI assistant director general and director for institutional planning and partnerships. Joint Actions for Common Challenges? What follows are the key findings and conclusions of the workshop above, which was co-organized by the Swiss Federal Office for Agriculture, (FOAG), the Food and Agriculture Organization of the United Nations (FAO) and the International Livestock Research Institute (ILRI). ILRI Assistant Director General Shirley Tarawali. The meeting began with an overview of livestock-sector issues given by Adrian Aebi, assistant director general of the Swiss Federal Office for Agriculture. Aebi highlighted the importance of the livestock sector for both sustainability and development. This workshop was a first conversation among three separate initiatives operating at the interface of livestock-environment-climate change-sustainability issues. The participants explored opportunities for capturing synergies and building on each other’s strengths. 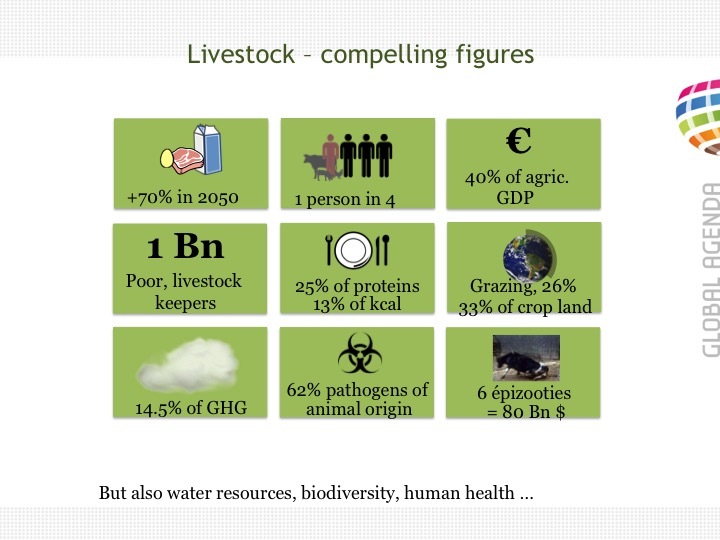 Slide presented by Neil Fraser of the Global Agenda for Sustainable Livestock (GASL). Neil Fraser, chair of the guiding group for GASL, introduced this initiative. He said the Global Agenda is a multi-stakeholder platform with many volunteer members representing highly diverse groups with a stake in the livestock sector. The Global Agenda includes all aspects of livestock sustainability, from global food security and health to resources and climate change to growth and equity issues. Andrew Achuo Enow, coordinator of GACSA Facilitation Unit, described the alliance as a multi-stakeholder initiative similar to GASL but with a broader mandate because it covers the whole of the agricultural sector while focusing specifically on climate-related issues. He said GACSA emphasizes the political, enabling environment and investment dimensions in these areas. Martin Scholten, co chair of GRA’s Livestock Research Group, explained that GRA is a voluntary network of scientists, policymakers, farmer organization leaders and others working together to gain a better understanding of how greenhouse gas emission intensity can be reduced while food security is increased. He said that the GRA focuses on research and practical, science-based solutions. —Diversity: The vastly different kinds of livestock production practised worldwide—from pastoral herding systems in drylands to mixed family smallholder farms in developing countries to industrial-scale production in rich and emerging economies—precludes use of any ‘one-size-fits-all’ approach to building safe, sustainable, profitable and equitable livestock systems. E pluribus unum or strength in diversity? The participants debated the usefulness of keeping these three livestock initiatives separate or joining forces as one entity. With the exception of representatives of farmer organizations, who were more in favour of having a single entity (a ‘one-stop-shop’ would make it simpler for them to engage), most participants favoured maintaining separation so as to retain the comparative advantages of each initiative but also recommended strengthening interactions among the groups and ending any redundancies. The three presenters and participants then moved to identify potential areas of synergy and next steps in capturing those synergies. Areas of overlap were illustrated and ‘unpacked’ and measures recommended to ensure there is no duplication of effort. There was consensus that the contributions the livestock sector can make to achieving the UN’s evolving Sustainable Development Goals (SDGs) should be emphasized and further efforts should be made by the initiatives to develop common messages. Informing and enabling positive changes in livestock practices and policies were viewed as central to all three initiatives. Representatives from donor organizations at the workshop challenged the three initiatives, viewed by some as ‘evolving experiments’, to articulate the tangible outputs they are delivering, a conversation that underscored the inevitable tension between short-term delivery goals and the longer term requirements of complex multi-stakeholder engagements. Specific GASL examples showed that some partners had taken time to buy in to the agenda and become part of its processes. Important for all participants, particularly for donors focusing on ‘value for money’, was that there should be no duplication of effort among the initiatives. —Identify and employ appropriate communications and knowledge sharing so that the members of each initiative know about the other initiatives, what the other initiatives have to offer and how the three initiatives complement one another. —Organize broader online consultation among the wider membership—possibly on a regional basis—to facilitate greater awareness and engagement among members of the three initiatives and their constituencies. —Organize bilateral discussions by lead persons so they can develop better ways of working together. —Arrange a follow-up tripartite discussion (this task was given to GACSA). —Share these results and their evolution. —Reconvene later to institute more specific and potentially deeper coordination mechanisms. Ren Wang, assistant director general for agriculture and consumer protection at FAO, delivered some concluding remarks emphasizing the shared view the participants held on the critical role of livestock in food security. Wang noted the need to be sensitive to the complexity and diversity of the world’s many livestock systems, which necessarily require diverse solutions for ensuring their sustainability and equitability. And he stressed the primary role of farmers, most of them operating at small scales, in food production. This moment in the fast-evolution of livestock systems worldwide is too important an opportunity to miss. Achievement of the SDGs will be impossible if the livestock sector is excluded from sector and development planning, funding and work. The livestock sector presents tremendous opportunities to address several of the world’s biggest challenges—from poverty, hunger, malnutrition and ill health to climate change, natural resource degradation and ecosystem collapse—through concerted and coordinated research and action. It is incumbent on all of us, the participants agreed, regardless of the particular livestock initiative we are involved in, to seize this window of opportunity to create a better, more sustainable, world. The next day, 26 Jun 2015, ILRI Assistant Director General Shirley Tarawali presented these conclusions of the Swiss Government-FAO-ILRI workshop on ‘Livestock and Climate-Smart Agriculture’ to 70 invited participants of a half-day event organized by the French Government and FAO on ‘The Contribution of Livestock and Livestock Products to Food Security and Nutrition’. the cultural value of livestock and animal food sources. Neil Fraser is chair of the guiding group for GASL, having been involved in its development since its founding event at FAO in 2010. At the time of his retirement from the New Zealand Ministry for Primary Industries in 2014 he was principal adviser (International Policy). Neil holds a degree in agricultural science and a post-graduate qualification in agricultural economics. He began his career as an adviser to livestock farmers in the hill country of New Zealand and later took up a role as lecturer in animal production at the universities of Botswana, Lesotho and Swaziland. In his subsequent career in government service in New Zealand, he has been engaged in work related to domestic agricultural policies and international policy, including participation as a delegate and in governance roles in FAO, the Organisation for Economic Cooperation and Development (OECD) and the Asia-Pacific Economic Cooperation (APEC). Andrew Achuo Enow, coordinator of GSCSA, is an agronomist by profession who has worked for many years as an agricultural researcher and research manager. He recently served as executive director / chief of staff in the Office of the Vice Chancellor at the Botswana International University of Science and Technology and before that served as director of Knowledge Fields Development at the National Research Foundation (NRF) in South Africa. His international career started with his employment at the International Council for Science – Regional Office for Africa (ICSU ROA) as program specialist for biological sciences. His research career started with his employment as a research assistant at the Institute of Agricultural Research for Development (IRAD) in Cameroon, where his areas of interest were soil fertility and land evaluation, soil microbial ecology and biological control of soil-borne plant pests and pathogens, plant pathology and plant-microbe interactions. 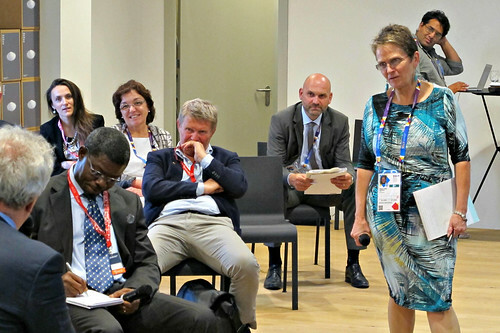 Tags: Andrew Achuo Enow, Expo Milano 2015, FAO, GACSA, Global Agenda for Sustainable Livestock, GRA, Martin Scholten, Neil Fraser, Shirley Tarawali, Swiss Federal Office for Agriculture, Switzerland. Bookmark the permalink.